I was excited to go to Vietnam, a country I had always wanted to go to and see how things had changed since they opened up to the world and the U.S. normalized relations with them. I had heard mostly positive reports from business colleagues and some of my more adventurous travelling acquaintances, which only served to fuel my excitement in going. Unfortunately, my trip was all work and no play, with only half a day of free time. However, I was given an outline via e-mail of a great half day walking tour based on my hotel location from a friendly stranger which proved to be just perfect based on the amount of time I had. 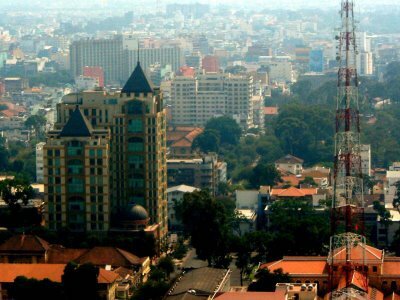 Despite normalizing relations with Vietnam and their booming economy, there are no direct flight options to Vietnam, although most of the Asian air carriers have connecting flights to Ho Chi Minh City and Hanoi. I had already flown into Thailand so it was an easy 1 hour flight from Bangkok to Ho Chi Minh City - they are pretty close. I took Thai Airways from the brand new Suvarnabhumi International Airport in Bangkok and was told to get there early. Boy was I glad I did. The new airport in Bangkok is massive and that goes double for the check in area for Thai Airways. Not that its size helps much, the line to check into Thai Airways - for both Int'l and Domestic flights - ran out the door and down the sidewalk. Despite having rows of check-in counters available the staff simply couldn't check people in fast enough. Worse, there was no way of knowing which row of counters you had to go to for your flight until you managed to get through the door and into the terminal. After wasting an easy 30 minutes inching forward in this long line, I finally saw a sign that indicated check in for business class passengers (thankfully my company pays for business class tickets when travelling overseas). Once I got there it was smooth sailing and I was on my way to the gate. However, once I got to the gate they announced that the flight was delayed (I apologize to my proud Thai friends but this is quite normal for Thai Airways, delays are too frequent and common). So despite arriving early and sweating in a long line I was destined to wait for Thai Airways to get their act together. Eventually, they herded us onto a bus on the tarmac where we drove around in what seemed like circles for 15 minutes before getting to our plane. (For your information, Thailand opened the new airport before it was 100% complete just to save face since it was already a couple of years late. Because of this, construction is still going on in various sections of the airport and not all the gates are available for the number of flights being handled by the airport). I settled down in my seat and closed my eyes and away we flew. It seemed we barely had time for a quick meal and a drink before we were landing in Ho Chi Minh City. For those of the Vietnam War-generation, Saigon is the only name they know for Vietnam's largest, bustling city. Even the 3-letter airport code - SGN - has remained the same. But after the Vietnam War was ended, the government renamed it Ho Chi Minh City in honor of their beloved leader. For some people my parents age and who lived through that era it will always be known as Saigon and in fact many of the locals still refer to it this day as Saigon. However I found that many of the younger people did refer to it as Ho Chi Minh City, particularly when talking to a foreigner. The airport is old and dated but it should be noted that Vietnam is making significant investments in transportation infrastructure and a new airport was hastily being constructed next to the old one. Althought the structure was quite dated and obviously unable to keep up with the number of flights and passengers being handled, everything was kept quite clean and orderly. While both the outside and inside looked as if they hadn't been changed much since the 70's, it was conspicuously clean and well organized. Long lines formed at immigration and when I got closer I could see why. Vietnam is one of the very few countries I have been to where the immigration control officers take their job seriously. These guys must have looked at my passport, their computer screen, my face, and back the passport again a dozen times over many long minutes before finally stamping my visa and passport and allowing me to go on my way. The baggage claim area was neat and orderly with uniformed government airport officers keeping close watch on everything. The AC was surprisingly in good order. The official Vietnamese currency is the Dong and it's close to worthless. Up until a few years ago everyone openly accepted US Dollars in addition to Dong - in fact, even today, you can still find prices for some things in Dollars and not Dong. However, several years ago the government clamped down and mandated that goods and services must be tendered using the official Dong currency. The current value of the Dong is about 16,700 to the dollar, although it fluctuates widely and the rate you get from banks and hotels can vary from about 15,000-16,000 and is subject to change by the day. Because of this, Vietnamese use very few coins, with almost all transactions being done using paper money of large denominations. I had promised a friend of mine to pick up some Vietnamese coins and the only way I could do it was to beg a restaurant to give me a portion of my change in coins instead of paper. I changed a small portion of money at the airport, figuring I could hit an ATM or bank later to exchange more. Besides, I was there on business and would be in meetings all day every day so there was little chance of me spending a lot of money. Walking outside the heat was nigh unbearable. That sounds hard to believe coming from hot and humid Bangkok, but for those who know how hot Bangkok is believe me when I say that Ho Chi Minh City is even hotter! The humidity is worse than almost anywhere else I have been and the temperature several degrees hotter than Bangkok. I squinted my eyes in the bright sunlight outside as I looked for my agent who had come to pick me up. I noticed a bright smiling young man who looked as if he could have passed for 19-20 yrs old oustretching his hand and greeting me by name. His English name was James and it turns out he was indeed young, although more like 25-26 than 19-20. Again, like so many other Asian countries I had been to, it seems as if the young people are "in charge" just about everywhere. I met the other people from my agent's office who would be accompanying me the next few days and it turns out I was the oldest in the group at 33 yrs of age and the only one married! We quickly set off for our first factory visit and meeting in a mercifully cool SUV.